Matt Zoller Seitz devotes his final Friday Night Seitz slideshow at Salon (he's starting as New York Magazine's TV critic Monday -- most deserved congrats!) to a list of his "Movies for a desert island." His rules: ten movies only, plus one short and one single seasons of a TV series, for a total of 12 titles. "Part of the fun of this exercise," he writes, "is figuring out what you think you can watch over and over, and what you can live without." Matt's titles include "What's Opera, Doc?," Season One of "Deadwood," Bob Fosse's "All That Jazz," Terrence Malick's "The New World" (surprise! ), Terrence Davies' "The Long Day Closes" (my #1 film of 1992), Joel & Ethan Coen's "Raising Arizona" (a movie I like, but consider among their lesser efforts) and Albert and David Maysles' "Salesman." Click here to see the complete list and Matt's comments. OK, I'm game. So, the challenge, as MZS sets it up, is not just to pick "favorites," but to choose pictures that will stand up to repeated viewing since nobody is going to get you (or vote you) off the island and "It is assumed that you'll have an indestructible DVD player with a solar-recharging power source, so let's not get bogged down in refrigerator logic, mm'kay?" For my short, it's a tough choice between Buster Keaton's "The Boat" (1921), Luis Buñuel and Salvador Dali's "Un Chien Andalou" (1929), and Chuck Jones' "Duck Amuck" (1953). I've seen them all countless times and never tire of them, but I'd probably choose "Duck Amuck" because I might be able to squeeze features by my two other favorite directors onto the list later. Or not. For my TV season, no contest (or, as Spiro Agnew might say, nolo contendere): "Twin Peaks," Season One. That would include the pilot, of course, because that was how we saw it in the U.S., though rights problems kept it from being released on DVD with the pilot until recent years. It's David Lynch's greatest achievement and it's about my home. I grew up with the mystery in the woods, and if I'm going to be on a desert island (which I kind of was -- living in L.A. when the show first aired), I'm going to need Douglas Firs and Snoqualmie Falls to keep me company. "Our Hospitality" (Buster Keaton, 1923). Awfully difficult to decide between this and the insanely inventive "Sherlock, Jr.," but there are passages of gentle nostalgia here (the train ride!) that make me swoon and smile. And a number of belly laughs, too. "Trouble in Paradise" (Ernst Lubitsch, 1930). The most perfect romantic comedy, ever -- the rhythms and movements and dialogue as musical as Lubitsch's famous operetta films. A sparkling diamond of a movie that I can talk along with and feel enormously witty and sophisticated. "Only Angels Have Wings" (Howard Hawks, 1939). The most entertaining movie ever made. Cary Grant, Jean Arthur, Thomas Mitchell, Richard Barthelmess. "Calling Barranca!" "Ball of Fire" (Howard Hawks, 1941). Sugarpuss O'Shea, people. Barbara Stanwyck, Gary Cooper, Dan Duryea (as Duke Pastrami) the seven dwarfs working on an encyclopedia, and a script by Billy Wilder and Charles Brackett that loves American vernacular like nobody's business. Possibly the best double-pun in movie history: "It's as red as the Daily Worker and twice as sore!" "North By Northwest" (Alfred Hitchcock, 1959) The most entertaining movie ever made. Again. Cary Grant, Eva Marie Saint, James Mason, Leo G. Carrol, Martin Landau, Abraham Lincoln. ROT. "Monty Python's Life of Brian" (Terry Jones, 1979) Because it's so damned funny, and I can sing along with "Always Look on the Bright Side of Life," which I may need to do (with the darkest possible irony). Such spiritual sustenance will be needed on a desert isle. "Don't worry too much about the myrrh next time." "Stop Making Sense" (Jonathan Demme, 1984). A good sound system (or, at least, decent headphones) will also be needed. I was never happier than when we played this movie at our Market Theater in Seattle's historic Pike Place Market in the fall and winter of 1984-85. What a blast. An ingeniously structured and joyfully performed show, and the most thrilling pop-rock concert movie ever, by a mile. 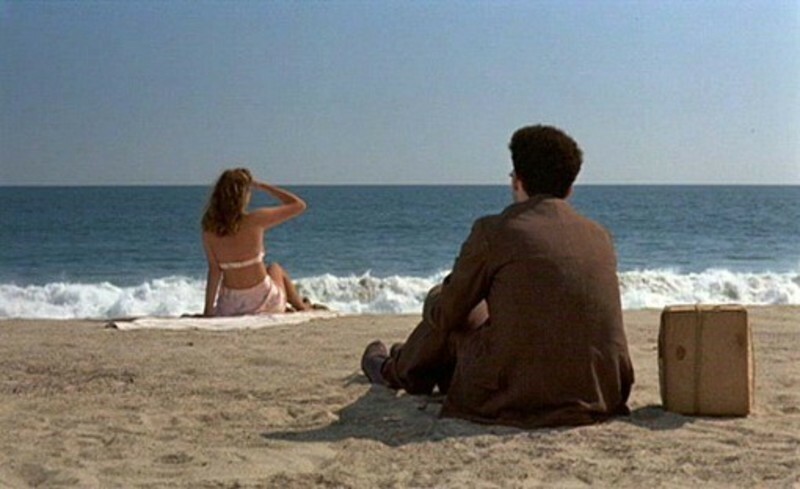 "Barton Fink" (Joel and Ethan Coen, 1992). "Miller's Crossing," "No Country for Old Men" and "A Serious Man" are better, deeper, movies, but this is one I can watch over and over again -- again because the dialogue is so musical and so funny. John Turturro, John Mahoney, Judy Davis, Michael Lerner, Tony Shalhoub, John Goodman, Jon Polito, Steve Buscemi, the mosquito, the pelican -- every one of them giving performances of impeccable timing and virtuosity. "Where's my honey?!?"